We had the pleasure of having the full Senior Ulster Rugby Squad for a mornings activity. 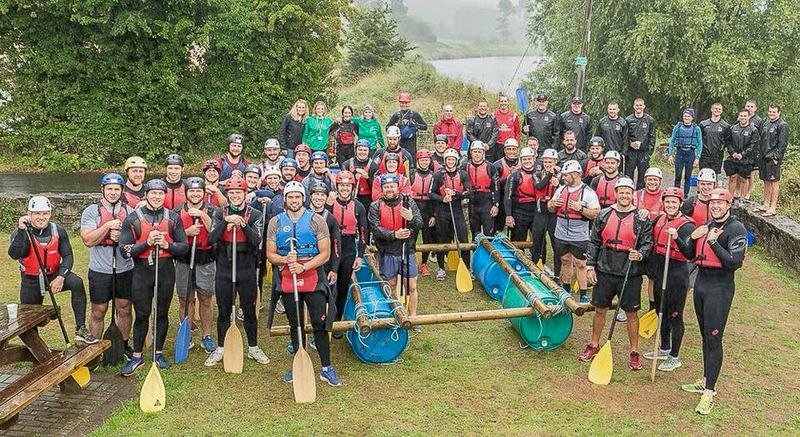 Through previous meetings with the Ulster management team, it was decided that we would run Raft Building as their chosen team building option to strengthen bonds between the older players and new upcoming younger team members who where breaking through into the senior panel. As the week was planned in the North Coast for their pre-season tour, focusing on team building, we decided to run a points system to their raft building session. The teams were comprised of 6 teams with 6 members, a mix of old and new. The teams met at the centre first thing on a cold and drizzling Monday morning to get their brief for the morning ahead. With all the elements battling against them, the cold, the wet and the dampness, mixed in with the low tide the Ulster boys rose to the challenge. Once they were all kitted up and ready, we headed off to Swanns bridge to start building their rafts, and after some deliberation, and head scratching on their rafts designs, they began tying all types of wonderful knots, some only resembling knots, and were ready for the first challenge to see if it would float and stay in one piece. Challenge number two was a bit more technical as they all had to get on board and paddle their creations down to the starting point for the third, and most important challenge, the timed race to see who the victors would be. Eventually all the rafts and teams made it to the starting point and so the scene was set. After some adjustments and rehearsals, the teams were ready and waiting, for the final challenge, THE RACE. The teams set off, two at a time, to see which team was going to be the fastest and after all the races and accolades were handed out the event passed off brilliantly. The Ulster boys had a ball and thoroughly enjoyed the morning and we wish them well for the season ahead. So, if you are considering team building as an option for your work place or a group of friends and were wondering if we were the right choice just ask Ulster Rugby. For up to dates options and packages on our team building packages contact us for a competitive quotation. A word of thanks to Longline Surf School & Coasteering NI for helping us attire the team for the day.